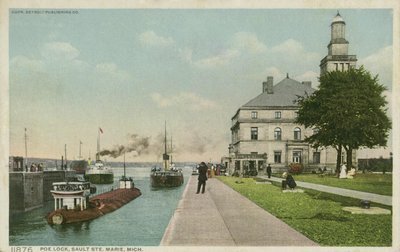 A coloured postcard of a whaleback exiting the Poe lock of the Sault Sainte Marie Canal, with another freighter in the lock. Divided back. Postmarked "Sault Sainte Marie, MI, 18 June 1910"
"11876 Poe Lock, Sault Ste. Marie, Mich." "Copr. Detroit Publishing Co."
Reverse: "Phostint Card. Made only by Detroit Publishing Co."